This week is Dementia Action Week and our Volunteer Officers have recently attended Virtual Dementia Training. This provided an immersive experience in how bewildering and overwhelming the symptoms of dementia can be. The training involves vision being obscured to replicate macular degeneration and headphones are used for sensory interference. Uncomfortable insoles were placed inside shoes to illustrate nerve pain to highlight that people affected by dementia may struggle to communicate their pain to others. Whilst experiencing the sensory overload staff were asked to complete a series of basic tasks including pairing socks, in day to day life such tasks are completed without much thought however suddenly small tasks became overwhelming and there was a strong feeling of vulnerability. 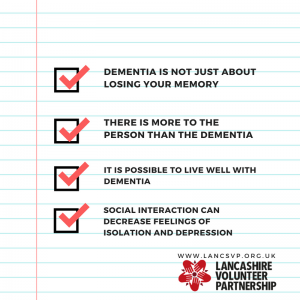 Our work includes meeting families and individuals affected by dementia and establishing how a volunteer can benefit them initially to matching a volunteer with similar interests. The training helped us to see how differently people can react to the difficulties faced and increased our understanding of how confusing information can become. This memorable experience enables us to be more empathic and appreciate even more the valuable work befrienders do both for the person they support and the wider family. If you would like to ask us any questions about our dementia training experience you can over on Facebook or if you would like to find out more about our befriending opportunities click here. You can read more about Dementia Action Week by clicking here.